It is with both gratitude and sadness that I write you this letter. 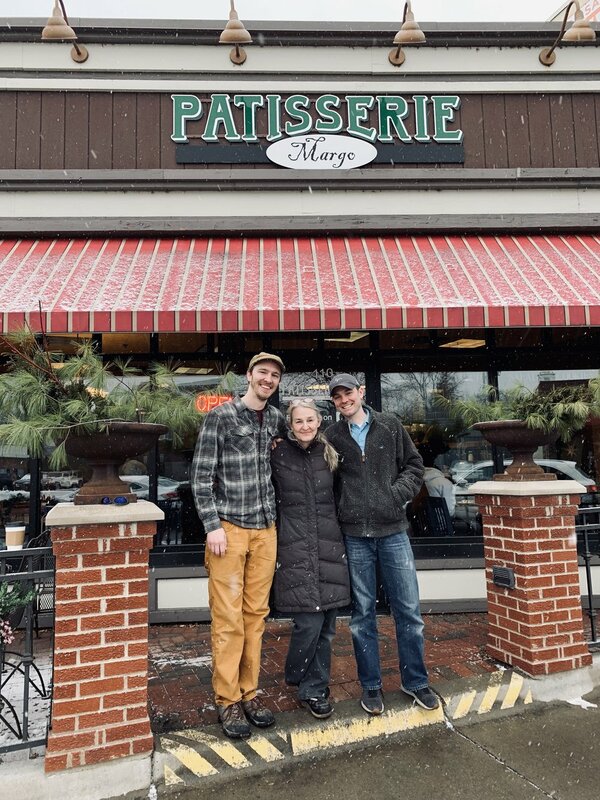 Patisserie Margo – Excelsior store closed its doors December 31, 2018. We will continue doing business in our Edina location. There are several reasons for this decision not the least of which is wear and tear on this aging baker. I will be having some surgery in January, which will require some time for recovery, and 4 beautiful grand children which Eric and I would like to spend more time with. We are so grateful to this community for your love and support over the last 10 years! We have loved doing business here and many of you feel like family. Though will we will miss being part of this city’s downtown businesses, I think the first step in our retirement will be to pare down to one store in Edina. We hope you will visit us there. Please come to or Excelsior location for complimentary coffee and cookies on December 31st. When did your love for making food begin? It started visually, rather than for eating. And it started when I was pretty young. My grandmother used to make incredibly beautiful desserts, and Christmas cookies that looked like jewels. I wasn't to interested in food as a kid. I was a very picky eater, but I just loved what was happening visually. Then when I got past my picky eating phase when I was in high school and college, then I started realizing that the way to most anyone's heart is through their stomach. If you feed people really good stuff it was always a nice foray into making new friendships. So that's how it began. I think my first attempt at baking I was about fifteen. I made a pecan pie and i didn't bake it well enough so it was runny. So my first attempt was pretty disastrous because you can't really eat an under baked pecan pie... But then after that i just started wanting to make things to eat how i wanted them. So I started taking recipes apart and doing things a little differently. I always liked the science of the process. What made a difference if you creamed butter and sugar at a high speed as opposed to a low speed? Why do cookies turn out crispy sometimes and soft and puffy other times? So I started doing that when I was in high school and college. Who taught you how to bake? A woman in Madison Wisconsin, her name was Anna L. She was French, and she had left France. She was working in kitchens there. At that time kitchens were utterly male dominated everywhere, but there was a little more opportunity in the United States. She was working in this little place. She had great skills, but she was also an extremely good manager and teacher. So I learned a lot more from her than just baking. They made Swiss and Austrian pastries. I had been working there a while and she asked me if I wanted to learn and i said yeah! So she showed me how to bake and execute those specific recipes. Then I graduated from Madison and I moved back to Minneapolis. A friend of mine told me about a pastry position at 510 Groveland. This is in like 1980s... because i'm old! *laughs* I went there and right off the top I told the chef, I am not a pastry chef. But I have experience with these Swiss and Austrian pastries. His response was that if I could do these recipes, he could teach me French. So I started! The reality was that this chef was very busy and didn't have a lot of time. So he would say, today we're going to need five pounds of puff pastry, three sorbets for service, two ice creams, and two of those sorbets are for intermezzos... and I was then suppose to interpret that. I had never made ice cream, sorbet, or puff pastry in my life. So I had to do a lot of learning on my own. Cook books back then were not as readily available so it was tough. He gave me a couple of books to use but they were all in French... and I don't speak French so... I muddled my way through. A lot of trial by fire. A lot. I'd research what I had to do the night before and it was... brutal. But it start me researching. Read. Research. Experiment. Repeat. And just do it. Wow. That sounds about right. You definitely would have to have a just do it attitude to make this possible. What inspired you to open your own bakery? Mostly I finally didn't have any more excuses to not do it. People had told me for years, you should open your own place! Having grown up in a family business myself, I understand what that really means. It means you work all the hard shifts, you work nights, early mornings, weekends, you just work all the time. So you knew what you were getting into? I really did know. People would ask me after we opened, is it a lot harder than you thought it would be? But no, I really did know how hard it would be. Well exactly, but there was a point where we didn't have a lot of other options. Our family needs were such that it really had to happen. thankfully my husband Eric was there to help me start and he's been there with me ever since. I couldn't have done it without him and our kids. We have four kids. I think when we began our oldest was fourteen and our youngest was two almost three. So we just fed then in to the work pipeline *laughs* and most of them are still with me. What do you like most about working with your family? That I get to see them everyday. Even though somedays we drive each other crazy. But whenever things are a little nutty I just think, you know there's not a lot of families that could together as much as we are and survive and not have... done each other in. *laughs* So we're doing pretty good! I'm just really thankful that I get to work with my kids and watch them mature in ways that a lot of parents don't get to actually see. I get to see that and it's pretty rewarding. What is your favorite part of your job, specifically? I really like working in the early morning when it's quiet. I'm a little bit of and introvert that way. But I really do like people. So I really enjoy having a bakery like this. It's a place where people come and it's usually a happy place in their day. So that makes it pretty special for me, the kind of interaction I have with my customers. And I really love the people I work with. What make Patisserie Margo unique? We're unique in that not a lot of places have the entire family working with them. *laughs* I Think we're unique in a way that, we have these tasks that need to get done but we hire someone we really invest and care about our people. So it's a family business all the way through. Yeah, even if you're not related to us, you're in the family. What's your favorite item at the bakery? mmmmmm..... eclairs. they're kind of the best of everything. Good intense chocolate, crispness and eggyness of the shell, and then the pastry cream. So what's not to love. we love you, thank you for coming in.